One great looking boat, a visit to one of the best beaches in the world, an all you can eat BBQ lunch and unlimited drinks. All you have to do is sit back and lap it up! It isn’t getting better than this… Welcome to the Whitsundays! 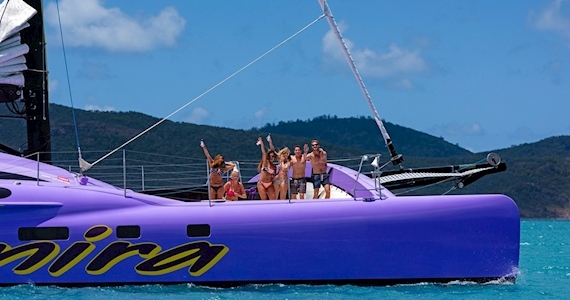 Experience the wonders of this full day sailing excursion exploring the Whitsunday Islands and Whitehaven Beach. Camira is one of the world’s fastest commercial sailing catamarans, so when the conditions are right, sailing onboard can be a real thrill! Camira is a world first with her sleek lines, spacious deck areas and breathtaking performance. She’s capable of sailing at up to 30 knots! This is a sailing trip so we rely on mother nature and naturally things will vary according to conditions but our fun, well-informed crew who have years of local experience will give you the best possible sailing experience and ensure you have a day to remember. This is a fully inclusive day cruise so throughout the day, you don’t need to reach for your wallet. All activities, morning and afternoon tea, a delicious bbq lunch and all refreshments are included whilst on board. Camira is licensed to serve beer and wine from 11am. GREAT BARRIER REEF ENVIRONMENTAL MANAGEMENT FEE: Included in your cruise fare is a per head fee which goes to the Government. The money collected is used by the Authority for the management and protection of the Great Barrier Reef Marine Park. The charge applies to both Great Barrier Reef Adventures and Camira Sailing Adventure.